Grave Digger flipped and landed on its roof in Tampa over the weekend, sending its creator, Dennis Anderson, to the hospital. If you grew up in Florida and you know Monster Trucks, then you can appreciate the gravity of the incident. For the uninitiated, Anderson is one of the fathers of the sport. In fact, Grave Digger was created in 1981, and has dazzled Monster truck fans ever since. 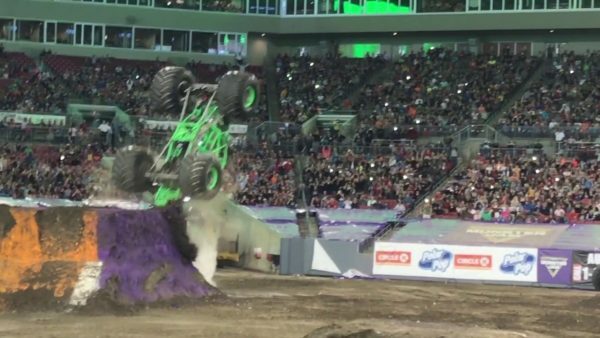 So when fans were cheering and waving their arms in rabid fashion as Anderson took Grave Digger through the freestyle segment of the Monster Jam at Raymond James Stadium, whooping and hollering as the truck soared and bounced through one run after the another, some kept cheering while others laughed. Everybody waited for what was next. What was next was an extraction from Grave Digger, and Anderson, famous also for Digger’s Dungeon, sat up and waved to his fans. Anderson was treated for injuries at a local hospital and is expected to recover.